Owned by rock legend Sammy Hagar, the Cabo Wabo name already has quite the reputation before you even see it. The Cabo Wabo in Cabo San Lucas was one of the city's first major nightclubs of size and elaborateness. Since it was first opened, the club/cantina has been garnering tons of positive attention thanks to an over-the-top grand opening featuring 80's rock band Van Halen. But don't let the name be what convinces you on Cabo Wabo. Come early enough to get a full lunch or dinner, the food at Cabo Wabo Cantina is some of the best and most uniquely crafted seafood & Mexican dishes in all of Cabo San Lucas! Try the Scallop Ceviche as a starter, Sammy's Tequila Shrimp, or the delicious Lobster Burrito. Stick around for the nightlife in Cabo Wabo, it is probably the top venue in the city for live music! Only in a place like Cabo San Lucas can you get a restaurant like Nicksan Japanese Restaurant and Sushi Bar. The experience of dining at Nicksan starts with the mood-setting sleek decor, made up of soft lighting, simple white walls and the dark hardwood bar that all combine to enhance a calm and elegant ambiance. But the setting is only the beginning. Nicksan's resident chef, trained in the styles of Japan, Mexico and France, combines his expertise in these distinct culinary backgrounds to concoct some of the most unique and most exquisite sushi rolls and Japanese-based entrees. With daily fresh fish catches, culinary staples of Mexico such as avocado and Serrano chiles, and French-inspired signature sauces and spices, Nicksans is truly a one-of-a-kind dining experience and one of the most lauded in Los Cabos. 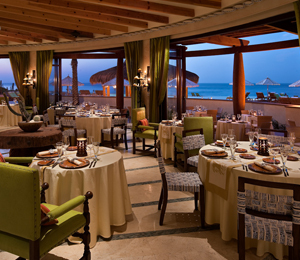 For the ultimate lobster dinner in all of Cabo San Lucas, there is only one place to go: Lorenzillo's! Lorenzillo's is one of the most famous restaurants in Cabo San Lucas, known for its live lobster house featuring fresh lobster caught every day right off the coast of Cabo. Its combination of delicious fresh food and the stunning waterfront views make Lorenzillo's a memorable dining experience for the entire family. You can get your lobster in all forms at Lorenzillo's including tacos, salads, in bisque, steamed, grilled, stuffed or doused in all kinds of signature sauces. Starters at Lorenzillo's include an excellent variety of seafood dishes ranging from soft shell crab served in olive oil to shrimps prepared however you like them. Seating is provided in the indoor air-conditioned dining room or out on the deck overlooking the marina. Located on the main marina in Cabo San Lucas, Solomon's Landing Bar & Grill offers its guests the quintessential Cabo dining experience. Solomon's has all the best in classic Mexican seafood cuisine in a casual, laid-back type of setting. The prices for both food and drinks at Solomon's are cheaper than most places in the immediate area. And with its spacious and plentiful indoor/outdoor seating, Solomon's is a great hangout spot for locals and visitors alike! In addition to its affordable prices, Solomon's Landing is also known for its friendly and attentive staff, and its energetic nights featuring upbeat pop and dance tracks from the 70s, 80s, 90s and current hits. Come to Solomon's Landing for lunch, dinner or a late night snack. Try the Mexican Combo, the Fresh Pacific Lobster dinner, or Solomon's Appetizer Plate.